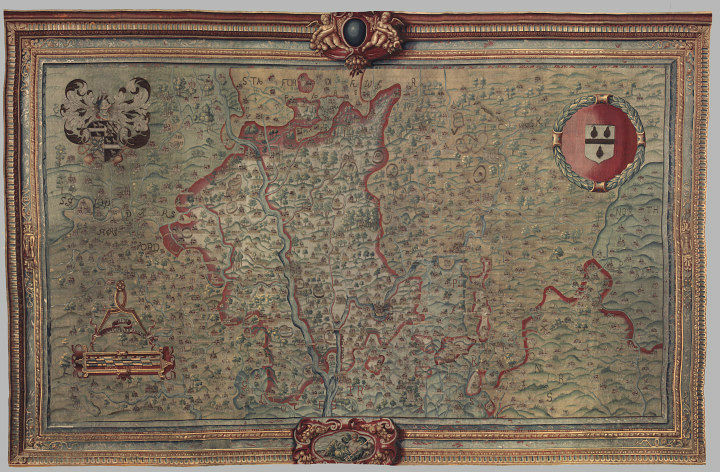 This map of Worcestershire and the adjacent counties was woven in tapestry. It is an updated 17th century version of an earlier tapestry commissioned by Ralph Sheldon (1537-1613) around 1590, possibly damaged in the Civil Wars (1642-47) when the family's house at Weston was pillaged. 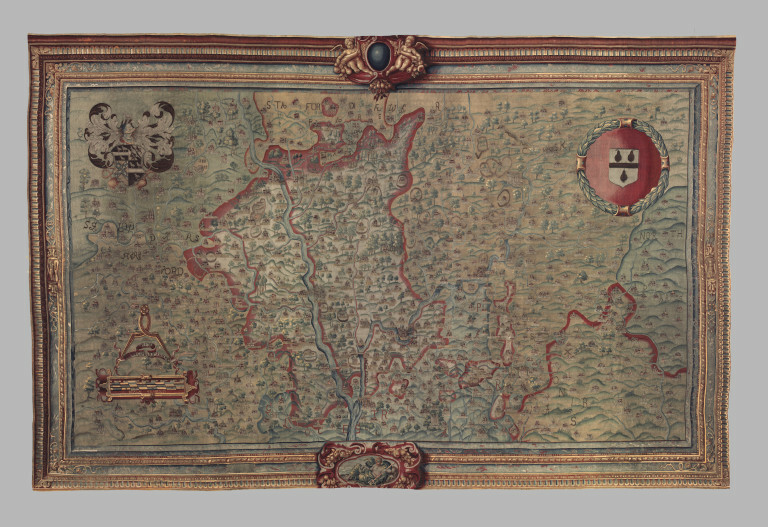 The cartographic details remained unchanged, but the Elizabethan decorative scheme was altered. Here, the arms of William Sheldon (?1500-1570) and his wife, Mary Willington, were placed in the upper left corner and the arms of Worcester city balanced them on the right. All the tapestries hung at Weston until the contents were sold in 1781. Three were bought by Horace Walpole, who gave this one and two others to Lord Harcourt of Nuneham Courtenay. His heir presented them to the Yorkshire Philosophical Society, from where this tapestry was on loan for many years, and eventually acquired by the Museum in 1960. Map of Worcestershire tapestry woven in wool and silk. Also showing the surrounding counties. In the centre of the top border is an oval shield flanked by putti with fruit. In the lower border is Neptune with a trident. 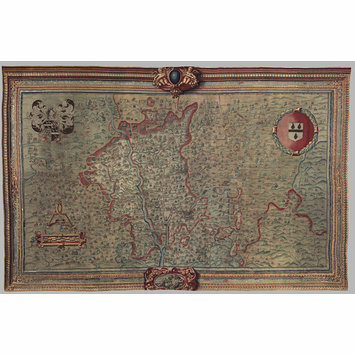 One of three tapestry maps with plain 'picture frame' borders, one of which (Oxford and Berkshire) has the arms of Ralph Sheldon the younger (1623-1684), which came from the sale of Weston Park in Warwickshire in 1781.